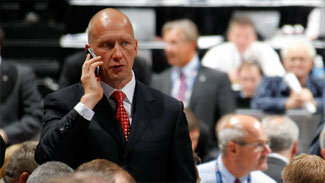 New Columbus Blue Jackets general manager Jarmo Kekalainen doesn't see himself as any different from the 29 other GMs in the NHL. However, he does understand the significance of his hiring Wednesday, which made him the first European-born full-time GM of an NHL team. "I am proud, but at the same time I'm going to try to approach it in a neutral way, just as I approach it with players," he said on a conference call Wednesday. "We're not favoring Finns or Europeans or anybody else based on the cover of their passport. I'm proud to be Finn, I'm proud to be the first European [GM]. But the work starts now, the challenge for me starts now. Then it's up to my ability and not my nationality to do the job and get the job done. I'm proud, but at the same time I try to put it in the background. I'm proud about it and I'm proud to be a European and proud to be a Finn." Fellow Finns around the NHL also were proud. Anaheim Ducks star forward Teemu Selanne, the leading Finnish-born scorer in NHL history, told the Los Angeles Times that Kekalainen's hiring was "awesome news. He is extremely passionate and knowledgeable about the game. He is going to be great for Columbus. Very happy for him." "Jarmo is actually a really good friend of mine and was my first agent a long time ago," Philadelphia Flyers defenseman Kimmo Timonen told NHL.com. "I am very proud of him and I am 100-percent confident he will make Columbus a better team." Minnesota Wild captain Mikko Koivu said, "I don't even think people in Finland can recognize how big it is. He's a great man, a good leader. He's done a lot of great things in St. Louis already, and obviously the last couple of years in Finland. I'm happy for him and it's a great think for hockey in Finland, as well." Kekalainen had success as a GM in Finland, guiding HIFK to a Finnish league title in 1997-98, and guiding Jokerit to the top of the SM-liiga standings when he left for the Blue Jackets. "I'm happy for him and happy for Finnish hockey," Minnesota Wild goalie Niklas Backstrom, who was part of the HIFK title team, told NHL.com. "It's huge for players to have a Finnish guy as GM of an NHL team. I've been on Kekalainen's team, back in the '90s, [so] I know him well. He's a hard-working guy, he's going to turn over every stone, and I think he deserves that [opportunity]. He's been working hard for many years and I know this has been his goal. I'm happy he got the chance." Blue Jackets president of hockey operations John Davidson, who hired Kekalainen, said his decision was based in part on Kekalainen's understanding of the ever-expanding European market. "When I started as a player there were very few Americans playing in the League, let alone Europeans," he said. "I think the world of hockey at the NHL level is a better place because of how North Americans played the game and how Europeans played the game. We've taught each other a number of different things [and] the game has become much better because of it." However, much like Kekalainen said, Davidson said finding successful players, regardless of nationality, is all that matters. "I watch games every night and there's competitive players that played from the United States, from Canada, from Finland, from Russia … we want players [in Columbus] that compete," he said. "Doesn’t matter to me where they're from, I want them to compete for the Columbus Blue Jackets and get us into a winning tradition."